Like our Facebook page for day to day info and what’s looking good in the nursery, with lots of photographs of the nursery and farm, news and views. 29th June, 7 - 9pm. £25 per person. Join us for this workshop where Rona will talk about attracting bats to the garden, what plants to grow and features that will benefit bats. Then David will show you the best bat boxes to put up and where to site them in your garden. He will also give a general talk about the bats we can expect to have in our gardens and if we're lucky he might have one so you can see it up close. Bats are protected species and essential to the ecology of our gardens and green spaces and this workshop will help you play your part. Places cost £25 for this 2 hour workshop. Included in the price is a starter pack of three 9cm plants to get you started attracting insects for bats. Please get in touch with individual businesses for information about these events. See their links on home page and contact page. Whitmuir is a destination visit. There is much to do and enjoy in lovely surroundings - and not at all far from Edinburgh. For gardeners, there is a really wonderful little garden centre called Quercus. The owners are genuinely enthusiastic and very well informed. These plants were born and bred in Scotland, nurtured to survive in our hostile Scottish climate. Everything I have bought here has thrived - I cannot say that about any other garden centre I have visited locally. Well worth a visit! The web site is now updated with our plant lists for 2019 and other wee changes and tweeks. I've added a new page to my blog which is a round up of interesting places and walks we've done over the past three to four years. It might give you some inspiration for new places to visit and explore this year. I'll add more as we keep on exploring. Picture links are an entire blog about that place, the list at the bottom are blogs that feature amongst other things, places we've been. The service is aimed to help visitors to the nursery who would like to have similar borders as we have here in the nursery but on a smaller scale. 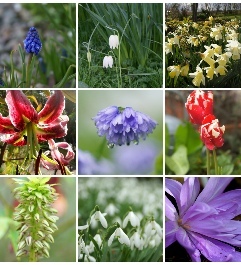 You can see some examples of these borders on our website on the nursery and gardens page. Please fill in the form on the link below. An upright evergreen shrub with pinnate leaves of up to 21 lance-shaped leaflets, and small, cup-shaped yellow flowers borne in erect, clustered terminal racemes to 35cm long in late autumn and winter. Good for pollinators. H 4m, S 3m.